R2-D2 Droid Star Wars Collectible Big 18 x 12” Robot Figure JAKKS Pacific Inc.
R2D2 Star Wars Ceramic Coin Bank Lucasfilm LTD. Collectors Edition Zak! See pictures for details. New in box. U.S. continental (48 state) shipping only. I do not accept returns on brand new items. 2004 Hasbro R2 D2 Action Figure "Dirty" Swamp? Sensorscope Loose Tatooine? Sensorscope Loose Tatooine?. Turn head and scope goes up. west coast is very costly from my location in Illinois. This Star Wars tenugui features R2D2 and Mt. Fuji with waves done in a traditional style in the foreground. 'Mt. Fuji' is spelled out with three kanji characters written vertically in the upper right corner. Kelloggs R2D2 Mailaway Cookie Jar. Condition is Used. This is for a Star Wars Disney R2 D2 Bowl Set. Each holds around 18 fl. oz., perfect for that sundae made with ice cream fresh-churned from blue milk. However, you probably will lose your lunch, should that happen. 4 R2-D2 napkins 4 C-3PO napkin rings. Materials: 100% cotton napkins plastic napkin rings. Includes 4 R2-D2 napkins 4 C-3PO napkin rings. Care Instructions: Machine wash cold. Tumble dry. Item sold as is. I will give as much information as I can. This is a genuine collection and I hate to part with it, but I need the space. My collection is massive and will be listed over the next few months. Both pieces are size 110 cm / 5 and made of 100% organic cotton. They have a fun kid style drawing of Leia and R2-D2 with the words 'May the Force be With You' and cute hearts all over front and back. Star Wars R2-D2 Screwdriver With 3 Forged Steel Bits - BRAND NEW. Condition is New. Shipped with USPS First Class Package. Salt and Pepper. See my other great buys. ~~~~~~~~~~~~~~~~~~~~~~~~~~~~. 8gb Star Wars R2-D2 Usb Flash Drive. Condition is New. Packaging may look rough in spots from being stored. Flash drive is unharmed. 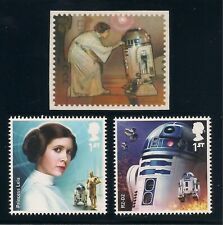 Features detailed image of R2-D2. Has rubber feet on back to prevent slipping. Star Wars Celebration Chicago - R2D2 and Porgs Embroidered Patch. 3.5 x 4". Condition is New. Shipped with USPS First Class Package. Star Wars R2-D2 Napkin and C-3PO Napkin Ring Set. Includes 8 Plastic Napkin Rings and 8 Polyester Napkins. Star Wars R2-D2 & CP30 Black Shadowboxes Foil Wall Art Print Artissimo. Condition is Used. Shipped free in the U.S.
(Battery may need to be replaced). Star Wars R2D2 Teapot - Quality Ceramic with Detailed Design by Underground Toys. Condition is New. Shipped with USPS Priority Mail. R2D2 Coffee Press. Condition is New. Shipped with USPS Priority Mail. Star Wars R2D2 usb hub charger lot used condition . Condition is Used. Shipped with USPS Priority Mail. This usb R2D2 hub is in used condition, the lights no longer function but the charger still works & makes sounds. Also comes with an R3-M2 small lego figure set. Thanks for looking & let me know if you have any other questions. This is the spring driven/battery power version (not the newer quartz). STAR WARS BRADLEY ALARM CLOCK. Capacity: 960ml. - Excellent filter system, combined with fine filter net, perfectly keep the coffee residue out of finished coffee, bring you smooth taste coffee. 1 x Coffee Press Pot. Slowly press down the plunger, then coffee is ready to serve. One side of the box exhibits several tears (as seen the photos), but the integrity of the box is unaffected. The unit is in the original box and was never used. The plastic was never removed from the parts. Others are made to give to special friends at the parade or during their annual ball as a favor. These doubloon-coins are becoming very scarce and hard to find, as they are in demand by collectors all over the world. This is a Pre-owned but in excellent condition measuring cups and spoons set that stacks together to create R2-D2. It includes 4 measuring cups and 4 measuring spoons plus legs/stand. Smoke free home and shipped with care. This listing is for ONE (1) ANA Star Wars Erasable Pen. There's C-3PO, BB-8, and R2-D2. They're all brand new. Send me a message when purchasing on which one you would like. If no message is sent, I will send one randomly. These are from Star Wars Celebration in Chicago and can also be found on First Class flights with the Star Wars ANA aircraft. STAR WARS: R-2 D-2 Portable/Changeable Screwdriver set with 3-Bits: 2 Phillips-head; 1 Flathead. Magnetic for better hold. Made in China by Shaowei Tools. Condition pre-owned, lightly used. 4"
R2 units: is there anything those little guys can't do?. You see, it makes R2-D2 whistle sadly when he sees a fellow device that's run out of power. Better to be safe than sorry with electronics procured from Jawas. Double Walled Stainless Steel (provides superior insulation). Used. About 10 years old, missing the antenna and small part on top but everything else works with batteries. Batteries not included. . Your R2-D2 Interactive Astromech Droid figure is packed with all kinds of features to help you fight the dark side—or just have fun throughout your day. This exciting little friend rolls, spins “dances” and plays music, “remembers” and reacts to famous Star Wars characters, guards your room, plays multiple games and can even find and follow you! And with awesome features like an illuminating light beam, infrared location sensors, an adaptable droid mood status indicator, a rotating dome, motorized indoor-terrain treads, a beverage holder and manipulator arm and special “secret” features, this figure is sure to keep the fun going for “light years”! Disney Star Wars R2D2 Screwdriver With 3 Forged Steel Bits New. Condition is New. Shipped with USPS First Class Package.